Home . . . . . . . . . . . . Patterns . . . . . . . . . . . .
Blog Redesign & More FOs! My sister, with some help from my boyfriend, was kind enough to redesign my blog. I'm really happy with how it turned out. It's very helpful to have a sister who understands my taste in most things. I hardly had to give her any input at all. And now that my blog is pretty and updated, I felt compelled to finally take more photos of my finished projects. 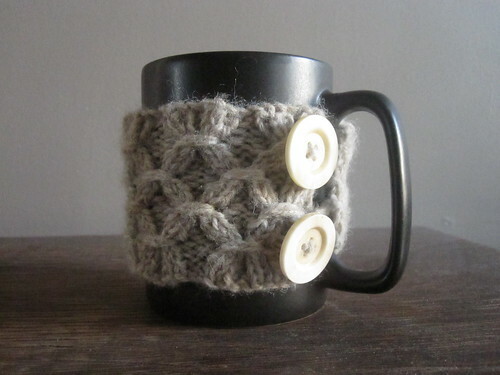 The first is a mug jacket which utilizes smocking stitch. 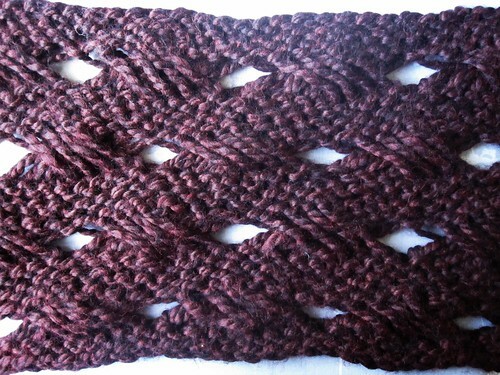 It's a fun and beautiful stitch to work with and the designer has a great tutorial for it. 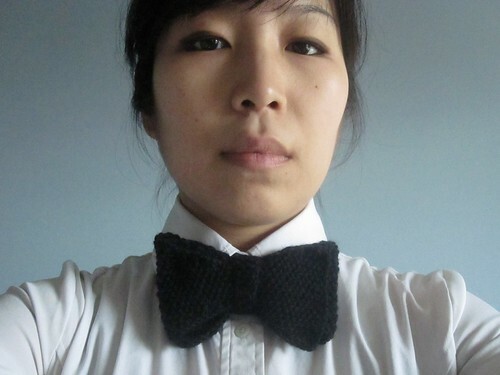 I thought it would be fun to have a knit bowtie. After many attempts, I finally managed to tie it on properly, and realized it made me look like a caterer. And then I thought I should have knitted the bowtie in pink and look like a member of Party Down. If you haven't seen this show, it's definitely worth watching. The next two projects were ones I improvised to use up yarn in my stash. 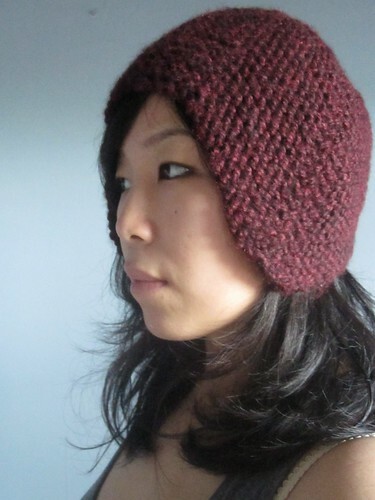 The first is a garter stitch hat which uses increases and decreases to shape the hat so it covers the ears. For the second project, I made a cowl using Indian cross stitch, which I found in A Treasury of Knitted Patterns. The tricky part was figuring out how to knit it in the round while keeping the pattern continuous and not having an obvious end of round seam. The pattern seemed like it would be very airy and not suitable for winter weather. 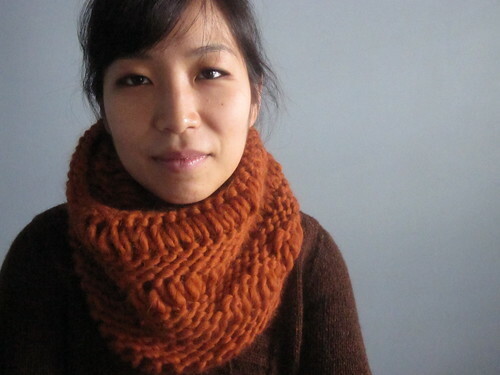 But since I knit it with a bulky yarn, the cowl collapses on itself and becomes quite cozy. 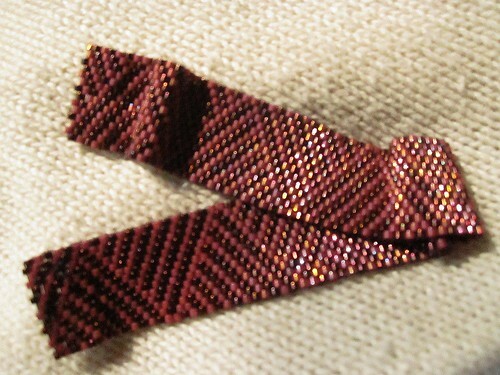 It also makes the stitch look like a basket weave pattern. 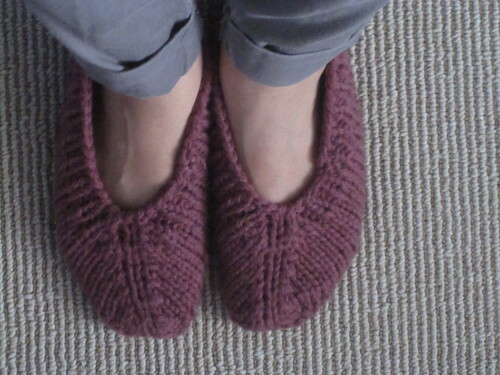 It's been quite a while since I've updated this blog, but that doesn't mean I haven't been knitting. In fact, I've completed quite a few projects, which I will try to share with you over the next couple of days. This first set is mainly accessories and small items I made to use up yarn in my stash. This bird's nest is purely decorative since my birds were quite terrified of it. I had to sprinkle some of their favorite seeds in the bottom in order to take photos of them near the nest. Izzy is the bravest, so she ate most of the seeds while Sophie watched from a safe distance. I used a variegated yarn I've had in my stash for over six years. 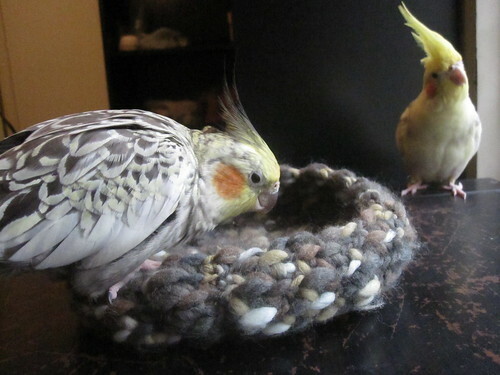 The nest was improvised using single crochet. This bookmark was the most difficult project I've ever made, but I'm happy with how it turned out. 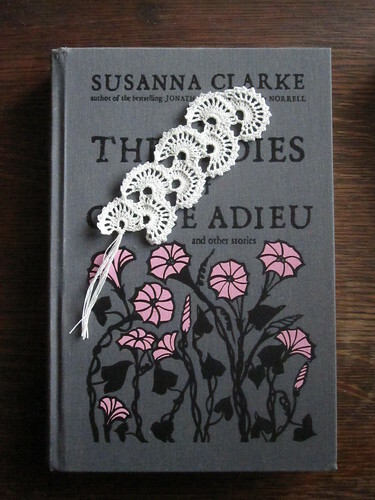 I omitted the tassel because I thought it detracted from the bookmark's elegance. It does need to be starched but I wanted to take a photo before I did that in case I screwed it up somehow. 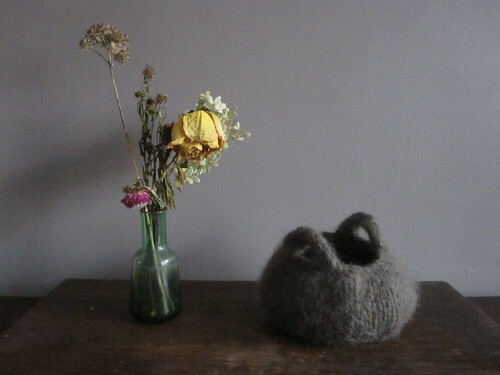 This tiny cauldon by Tiny Owl Knits is my first felted project. It isn't actually that "tiny," but I couldn't get it to shrink more. 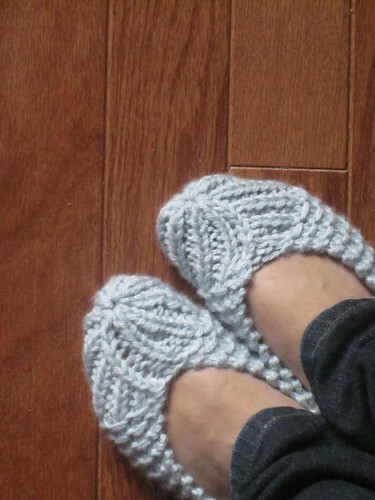 I also decided to knit myself some slippers to wear around the house. I found two patterns I liked. This first pair turned out a little snug, but I really like the way they look. The second pair was only written for a women's size 9. Since my feet are size 6.5, I adjusted the pattern by working the sole for only 56 rows and picking up 72 sts around to work the sides. 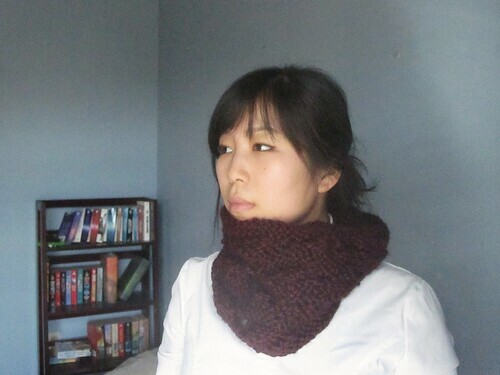 And since I love scarves, I had to knit myself this drop stitch cowl. It's the first time I've tried that technique. I love how the cowl turned out, and the yarn is one of my all-time favorites. Another technique I had never done before was to make pom-poms and tassels. 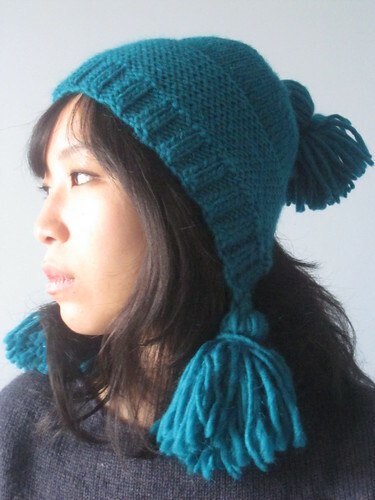 I thought this capucine hat pattern was really cute and it covers the ears, which is always important in winter hats. I apologize for the not-so-great quality of the photo. I have 12 more projects to share, including 3 of my own design, plus a knitting program my boyfriend wrote for me. Hopefully I'll have everything photographed and posted in the next week or two! About two years ago I learned how to make beaded jewelry, specifically using the peyote stitch, through this great website called Communiteach. Basically, you can find people who are willing to teach you something you want to learn in exchange for you teaching them something they want to learn. I got to learn beading, and I taught knitting. I finally finished the bracelet and sewed on snaps, which was the most annoying part. But I'm pretty happy with how it turned out. It's not a great photo, but I think it shows my favorite two features of the bracelet - its iridescence and fluidity. I don't really wear jewelry, but I really enjoyed the process of making it. And this is kind of true of the things I knit as well. I really enjoy the process of making stuff a lot more than having the final product. And this may factor into why I have had so many unfinished projects hanging around while I start new ones. One of my stash-busting projects I made recently was this crocheted bookmark, which I probably won't use very often, since I don't read that much anymore. 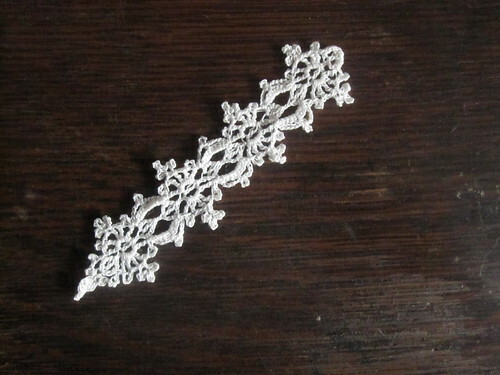 It was the first time I worked with such a small crochet hook and fine thread. That made it a little difficult, but the pattern itself was pretty easy and quick to make once I got the hang of it. Another stash buster were these knit jar covers. Since I'm a little bit of a hoarder, I have several jars, some of which I use as vases. 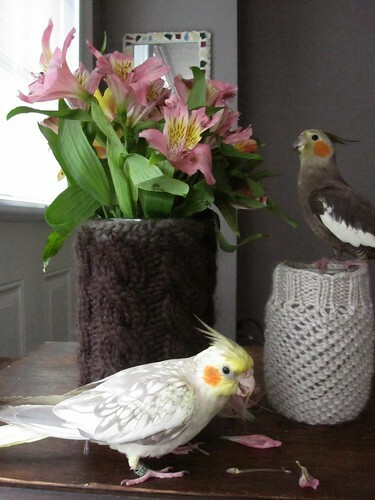 And this seemed like a cute and useful way to use up yarn. I also decided to learn the magic loop technique so I wouldn't have to use double pointed needles. It's a great method and I highly recommend it.